The process of making popiah is somewhat easy — the trick is to find a dedicated sous chef (or a small army of them) because the hardest part of making these rolls is chopping everything up. You want to make sure that the ingredients are thinly sliced so you don’t get too much of one in each bite — the spread should be even. Once all the ingredients (listed in the recipe below) are finely chopped, you stir fry them together in a pan until it’s slightly softened. You don’t want it to be so soft that it’s soggy but you don’t want it too crunchy either. Now, Simpson’s recipe (which is in the book but also shared below) features a fairly standard list of popiah ingredients (shrimp, jicama, tofu, garlic, shallots) but my grandmother’s is a little more elaborate, involving carrots, beansprouts, crushed peanuts, Chinese sausage and scrambled eggs as well. 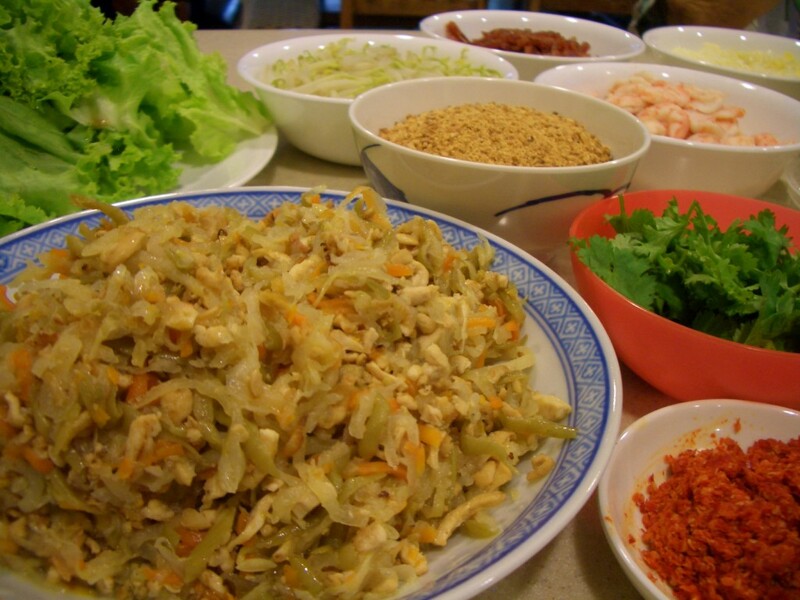 In Singapore, when we have popiah parties, all the ingredients are laid out on a counter and people are invited to roll as many as they wish to eat. The grandmother was happy to show me how it’s done. First there is the wrapper — now, in the U.S. you can use any basic summer roll wrapper that you find in Asian grocery stores but in Singapore, my family likes to get its wrappers at Kway Guan Huat, a famous popiah stall in the Joo Chiat neighborhood that has been making its own popiah (and popiah skins) since the 1940s. The place is a true treasure in Singapore — if you’re ever there, you must check it out. On the day of our popiah-making in Singapore, however, my mother and I were lazy to drive to Joo Chiat so packaged wrappers from Spring Home it was. … and other ingredients (shrimp etc.) in the amounts that you desire. Once that’s all piled on, the roll is ready for wrapping. When wrapping, you want to make sure the ends are sealed so the filling doesn’t come tumbling out. Once you’re ready to eat, you just slice it up, dip it in chili sauce and sweet sauce (a brown sauce that’s slightly salty — it basically tastes like a sweet, thick soy sauce) and dig in. Now, when learning how to make popiah, I had the great fortune of learning from not one but two great cooks — chef Simpson agreed to teach me his recipe when I was particularly heartsick for them one chilly day in New York. And I was so grateful for his recipe that I included it in my book. Now that spring is finally here, I think it’s the perfect food for a little party. You have the recipe below, warm weather is here, so take out your calendars, and get to it! Don’t forget to check out the Let’s Lunchers’ small bites for spring below! And if you’d like to join Let’s Lunch, go to Twitter and post a message with the hashtag #Letslunch — or, post a comment below. In a pan, heat 1 tablespoon of canola oil over medium heat, add the shrimp, and sauté until they are cooked through. Remove the shrimp from the pan and set aside. 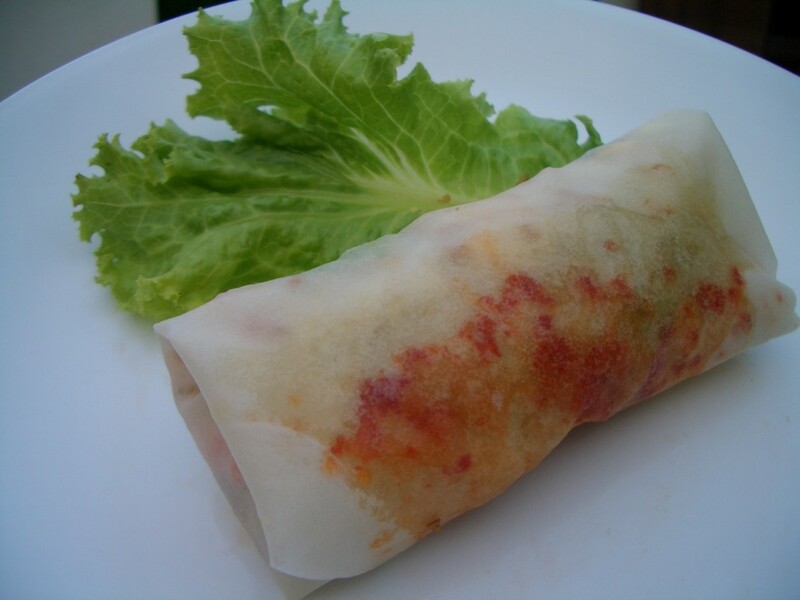 Lay a sheet of popiah skin on a clean surface; put a piece of lettuce on top; place the cooled shrimp, jicama, tofu, and scallions in the middle; and gently fold the extra skin over to form a roll. Continue making the rolls. Add Sriracha sauce and the remaining soybean sauce to the juice. Slice up rolls into 3?4-inch-thick slices; serve with dipping sauce on the side. This entry was posted in Appetizers, Asian, Books, Chinese, Let's Lunch, Recipes, Shameless Promotion, Singapore, Singaporean, Snacks, Southeast Asian and tagged Appetizer, Beans, Carrots, Chinese sausage, Fukienese, Hokkien, Jicama, Kway Guan Huat, Oyster sauce, Popiah, Shrimp, Singapore, Singaporean, Snack, Summer roll, Tofu by Cheryl. Bookmark the permalink. If you left SF one day later, I would have invited you along to the popiah party at my friend’s place. We also had homemade laksa and chicken curry!! Nothing like learning from two masters! 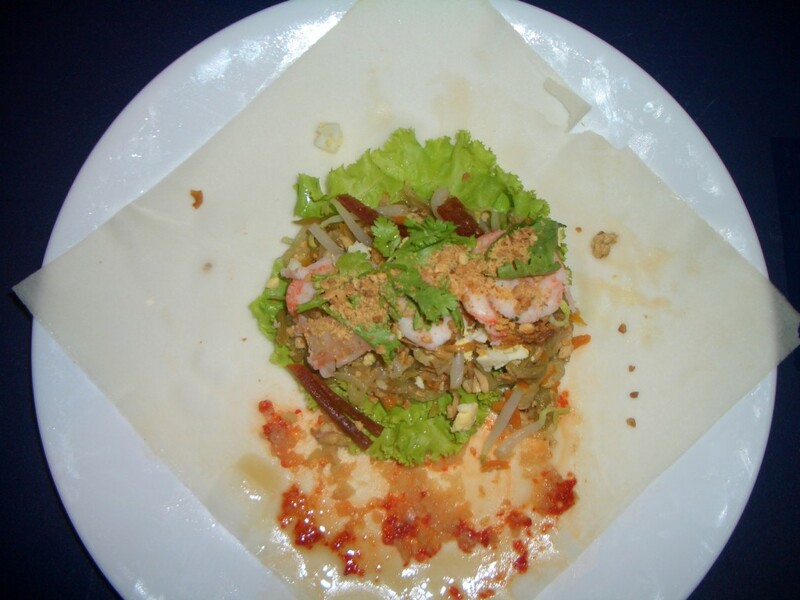 Now I’m wondering if rice paper would work in place of the spring roll wrappers? Beautiful post, as always, and the ingredients sound like such a great mix of salty, savory and sweet. Fantastic! I love springrolls. After reading your post, I cannot wait to try Popiah; love the thought of slightly spicy, and crunchy, at the same time. May have to talk Danielle into having another Popiah party for her American friends and/or come to New York, and talk you into making them for us. 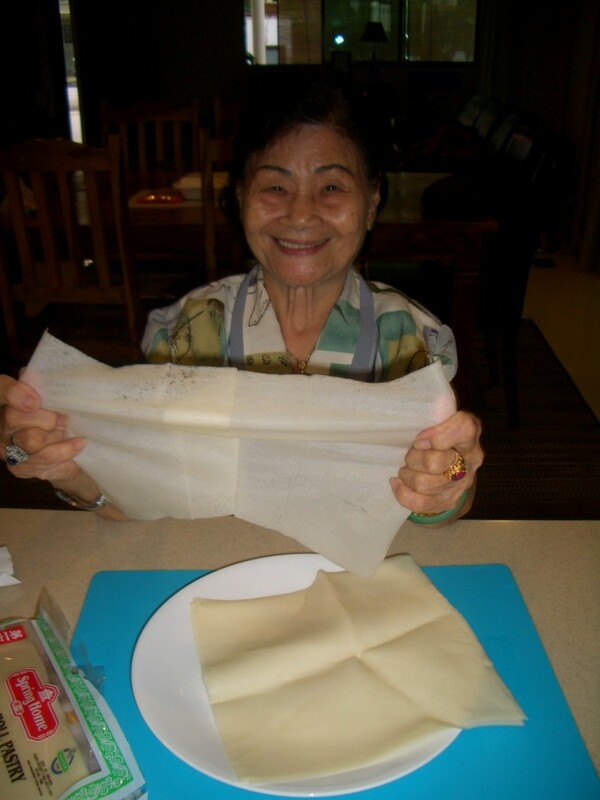 Check out this recipe, which I got from a Singpaorean Peranakan lady who cooks very well. I am impressed to see Popiah in NY. For those like me who are located elsewhere, Ohio, that is a fond reminder of home. 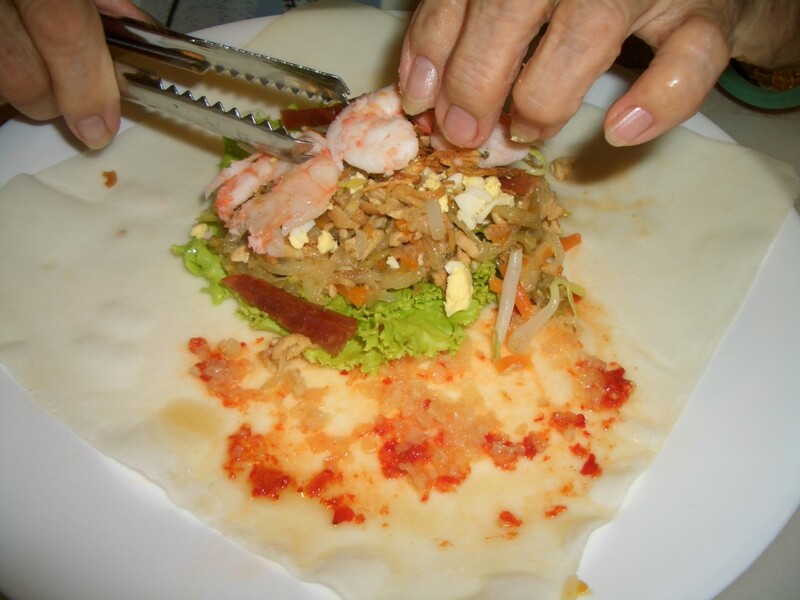 Your post reminds me of the homemade popiah my mom would make when I was growing up. She even made the skins by hand in an electric skillet. I remember watching in amazement as she held the sticky dough in her fist and swirled it every so quickly in the skillet to create the thinnest pancake possible. Although it was a day long affair creating all the skin and all the fillings and toppings, I fondly remember these special occasions. I just finished reading your book, Cheryl–it was beautifully written, thank you for writing it. Barbara, thank you so much for your kind words. I’m so glad you enjoyed it! 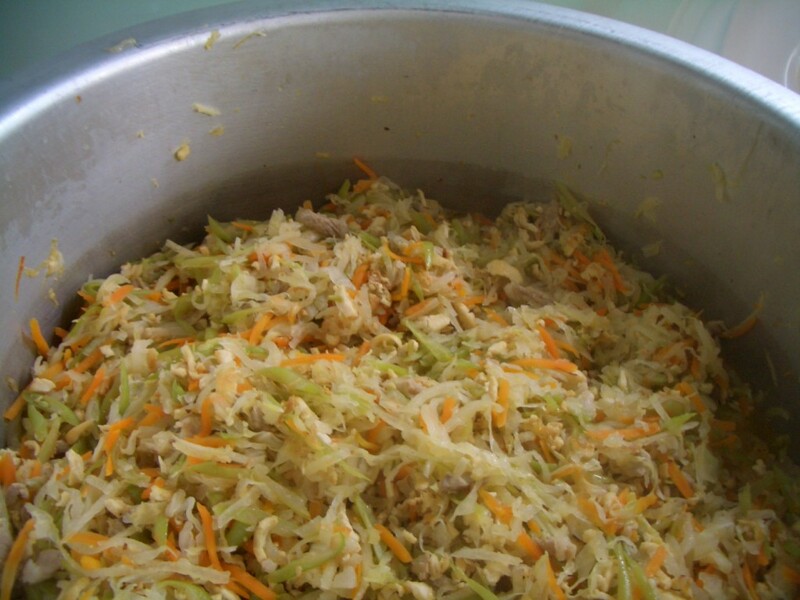 And I hope you like the popiah recipe…I suspect your friend NeeWee is enjoying plenty of it back home right now! 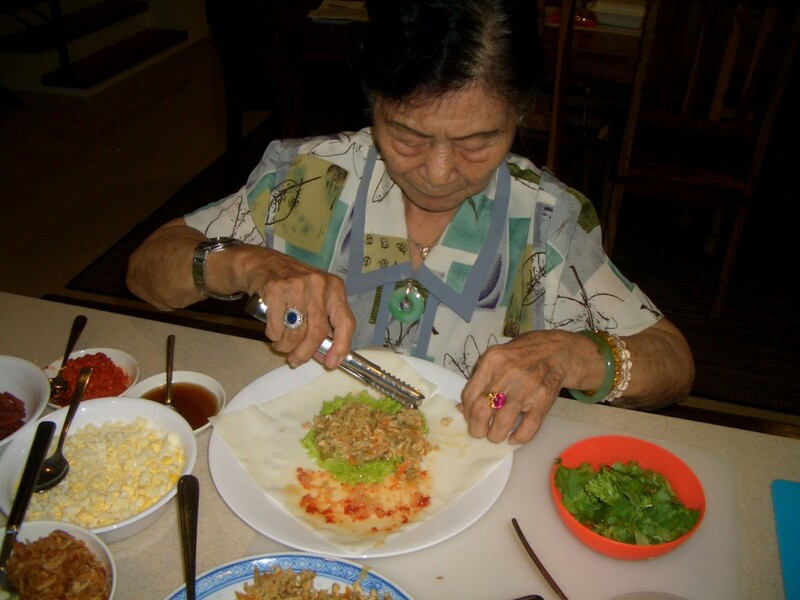 Hi Cheryl, I am an American living in Singapore in Katong (lucky me popiah on every corner). Popiah is my fav food of Singapore, and I needed this! Thanks for the lesson. I would love to learn how to make the skins. I know this takes lots of practice and have been bedazzled by the hands in Joo Chiat’s Kway Guan Huat. I’m in the process of reading your book and really enjoying it. Thanks for the recipe. I grew up in the Philippines with Hokkien parents. We call this dish lumpia (that’s how it’s spelled locally) but it sounds more like dun-piah in Hokkien. I used to help my mother make this a lot. The meat/veggie filling is pretty much the same, we don’t use any hot sauce but make a homemade slurry of cooked starch, soy sauce, sugar and garlic. We also add crushed peanuts (mixed with sugar) and a seaweed product called ho-di mixed with deep fried rice noodles (which are crispy) – both as toppings before rolling. Um, um, um. It is so good…but alas, a lot of work! I still have to make it for my children. Am enjoying reading your book, and the recipes! Thanks so much for your kind words…so glad you’re enjoying the book and I adore lumpia! Have never made it though — or thought about its connection with popiah and how similar it sounds. Would you care to share your recipe?